WHY SOLEA?? The number one fear that stops patients from visiting your practice, the fear of the needle! Solea allows you to provide your patients with the comfort of knowing they won't need an injection. This is a huge marketing tool that attracts new patients and will grow your practice! Increase your production by offering new soft tissue services and doing MULTI-quadrant dentistry. Giving anesthesia and controlling blood are the 2 most inefficient things a dentist does in their practice. If you think about it, those are the two things that require you to stop what you are doing and wait. In the case of anesthesia, it also limits you to working one quadrant per visit. 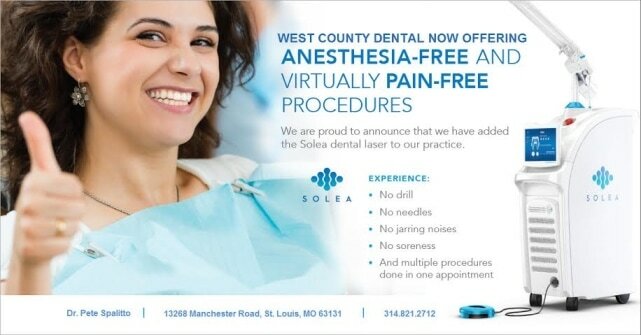 SOLEA LASER is quickly becoming one of my favorite pieces of technology. CEREC has always been at the top of my list, and anyone that currently uses CEREC in their office will understand the impact that technologies like this can have on the growth of your practice and the pure enjoyment it adds to your day, never mind the amazing benefits for the patient! Getting injections, the sound of the drill and blood are the reasons patients hate the dentist! Patients will seek out a dentist that offers this option of no needle, no drill! I was in an office presenting solea to a customer, a patient overhead us talking and asked us to step in to the op, she stated that if the doctor purchased the Solea she would be her first patient and she would tell every friend of hers that they have this technology... and I would be willing to pay MORE!! Dentists hate waiting for patients to get numb, its a waste of time! What's a doctors most valuable asset? Your time!! What if you could walk into the room and start prepping for a restoration immediately, without anesthetic? With Delta and other insurances starting to impact your bottom line, you need to change HOW you do dentistry, you need to adapt to the changing environment. You need the ability to do multi-quadrant dentistry!! You are able to work on any tooth in the mouth without anesthetic. How would it impact your production if you could do 2,3 or 4 restorations on a patient in 3 different quadrants? With Solea you can do both hard and soft tissue work with a single laser that actually works!! CO2 lasers are the Gold standard in medical and dental for soft tissue. How many soft tissue cases are you not treating or are being referred out? Frenectomy, gingevectomy? Babies that are tonque tied can have this procedure and it will help them be able to feed, this is actually a serious problem if you can connect with a local pediatrician who will refer patients to your office! It's not so much about the patients you have now, most of your patients deal with the needle, they come to see you, but what about the 50% of patients that refuse to go to the dentist? Which dentist is going to take advantage of that marketing opportunity in their area? Solea is the first laser that can cut any tissue with a single-setting. Its revolutionary software is so simple, any dentist can become a laser dentist. With Solea’s unique wavelength and computer controls, dentists can reliably perform procedures anesthesia-free, blood-free, suture-free and pain-free. For dentists, these are powerful practice growth drivers – for patients it’s getting more done in fewer appointments. No other laser technology delivers such a dramatic reduction to procedure time, enables multi-quadrant dentistry, and allows dentists to perform more soft-tissue procedures that are often referred out. The power of reviews. A patient that just left this office wrote this review on Yelp about her experience with an office that just got a SOLEA Laser! Here is the ROI for this technology. How many potential patients will read this and decide to come to this practice, and how many people will she tell about her experience that will change dentists? “So far it’s been a heaven sent. Patients love it. One of my patients left a huge yelp review praising her experience." Did crown lengthening with Solea and two crowns with cerec today! Here's a great example of marketing your brand versus offering the $59 new patient special! Which offer do you think attracts the type of patients you want in your practice? Which marketing strategy builds your brand of offering high tech value added services that don't focus on you discounting your prices but getting patients coming to you and paying your fees? Which strategy do you think will keep your patient base loyal to you versus looking for the next promo?? ?